My older son is 13 years old. He was born at 24, December. He was grow up! Nabe party in my son's mother house. Before we ate food, we tried to take a picture. But I forget every time. This time I could take a picture before almost gone. I think you might be confused with Taiyaki and okonomiyaki. I like takoyaki, okonomiyaki, and taiyaki. If I have to choose one food, I choose taiyaki. Because when I was young, I ate taiyaki with my mother. I'm sorry I don't have any pictures of taiyaki. My younger son have sprained his ankle one month ago, when he went to class trip. He said " it hurts. I can't walk!" But next day, he could walk easily. My younger son had influenza last week. I took off. And he went to school after he was good. There are a lot of students had influenza in his school. His class was closed. I didn't take off more. So he visited his gland mother's house. He was very happy this week. He almost took off two weeks! Off course he will go to school tomorrow. It came autumn in Japan. It is almost winter. Sometimes it is very cold and sometimes it is warm. When I was young, December was month of autumn. But recently it is very crazy weather in the world. My uncle who lives in Nara sent me this picture. 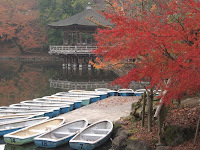 He found Autumn in Nara. So we went to find Autumn in Tokyo. My younger son is getting to ride bicycle better than that day.